Clearly rattled by the mounting body of evidence of blatant violations of the rule of law and Constitutional rights under the cover of anti­-Maoist operations, the Bastar police has launched a no-holds-­barred attempt to silence all those who are calling them to account. Advocate Shalini Gera and her colleagues of JagLAG who were in Jagdalpur in connection with a case of false encounter of a young Adivasi boy , were confronted on the night of 26 December by a police team which entered the dharamshala where they were staying and accused them of being there in an “unauthorised” manner. Despite the fact that they were following up on an order by the Chhattisgarh HC for exhumation and a second post­mortem in the case and their accommodation had been arranged by the office of the Divisional Commissioner, Adv Shalini and her colleagues were ordered to come to the police station for interrogation. Attempts were also made to forcibly search their rooms and belongings. When asked to produce a warrant, the SI in charge of the team became even more aggressive and abusive. It took a personal call from the Divisional Commissioner to the SI to force the police to back off. Statement of recent attacks against lawyers in Chhatisgarh, Jagdalpur working for under trial prisoners, Adivasi activist Soni Sori, Journalist Malini Subramaniam, public intellectuals such as Bela Bhatia among others. Concerned individuals and Organisations from the Civil Society of West Bengal organised a Press Conference at Press Club in Kolkata on 24th February 2016. Maroona Murmur (History Prof., Jadavpur University), Tapas Chakraborty [Association for Protection of Democratic Rights (APDR)], Choton Das (Bandi Mukti Committee) and Anuradha Talwar [Women against Sexual Violence and State Repression (WSS)] spoke on the occasion and were accompanied by Debapriya Mukherjee [Advocate, Human Rights Law Network (HRLN), West Bengal] and Atindriya Chakraborty [Advocate, Persecuted Prisoners Solidarity Committee (PPSC)]. 2 uniformed policemen from Papra thana visit Bela’s house and click photos of her, Jean and the interior of the house. This is followed by a visit from two people in civilian clothes carrying Chhattisgarh Police ID. 22.2.2016 JagLAG’s ex-landlord is called into the Bodhghat thana again – this time because there is a complaint by some Dipankar Sahu against “three women who are anti-social elements” who are staying in his house. Protests in Delhi and Bhopal. Delhi protesters are detained by the police for several hours. 21.2.2016 IG, SP cast doubts on Soni’s story, saying that she is exaggerating the story. She is discharged from the Jagdalpur hospital and taken to Delhi, where doctors confirm that she has facial burns due to an unknown substance. On 23 February 2016, Coalition against State Repression calls for people to join us in a protest against State violence and repression against Dalits, Adivasis and Minorities which the State has been perpetrating in different parts of the country including Chattisgarh in the recent past. This is also in solidarity with the Kashmiri Women’s Day of Resistance which marks the 25th anniversary of the mass sexual assaults of Kashmiri women and torture of Kashmiri men in Kunan Poshpora. 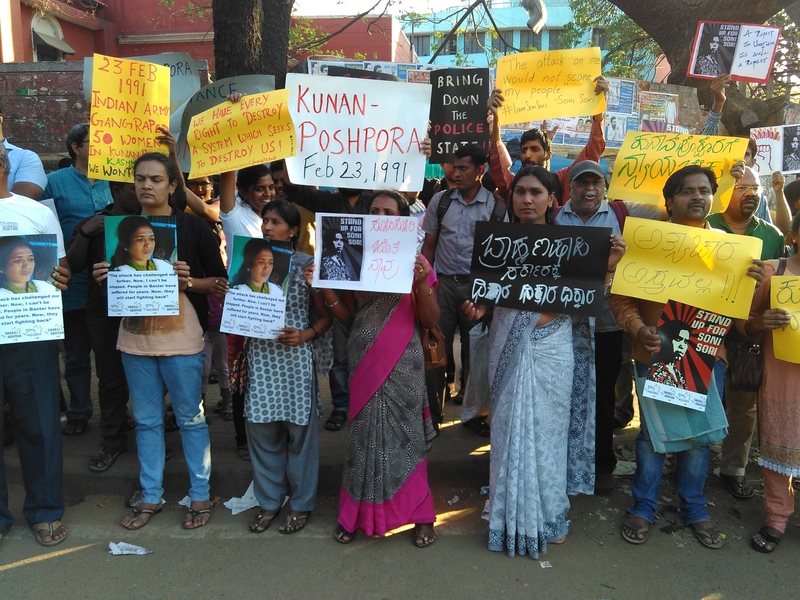 A group of about 50 people, including students, lawyers, activists and organisations who have come together under the banner of Coalition Against State Repression, held a demonstration at the Mysore Bank Circle in Bangalore on 23rd evening. They protested against State violence and repression on Dalits, Adivasis and Minorities – focusing on the recent attacks on Soni Sori, lawyers, journalists and activists in Chhattisgarh and expressed solidarity with the Kashmiri Women’s Day of Resistance marking the the 25th anniversary of the mass sexual assaults of women and torture of men in Kunan Poshpora.